David R. Boyd. 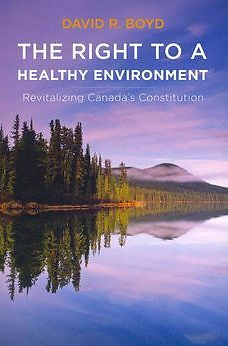 The Right to a Healthy Environment: Revitalizing Canada’s Constitution. UBC Press: Vancouver, 2012. 336 pp. $29.95 (paperback) ISBN: 9780774824132, $85.00 (hardcover) ISBN: 9780774824125. Examining the intersections of law, history, and the environment, David R. Boyd believes that constitutionally protected environmental rights are the best answer to addressing some of Canada’s most pressing environmental issues. Environmental issues have become quite polarized in Canada and citizens across the nation have struggled to figure out the right approach to solving some of the pressing environmental concerns. David R Boyd’s The Right to a Healthy Environment: Revitalizing Canada’s Constitution provides a new perspective on this debate as his book dives deep into the Canadian constitution and the environment. Boyd is a leading environmental lawyer who has written about environmental rights on numerous occasions both in print and in newspaper articles. Boyd argues firmly that Canada must entrench environmental rights into the constitution to have the best chance at creating and maintaining a healthy environment for future generations. He demonstrates this by examining the history of constitutional issues with respect to the environment but also makes a comparative analysis between Canada and the nearly 150 countries around the world that have some environmental rights constitutionally entrenched. Boyd examines, in his opinion, the critical failure of the Canadian government to entrench the right to a healthy environment into the constitution despite having the opportunity on several occasions when Canadians were engaged in constitutional dialogue. Unlike other constitutional issues that dominated the discussion such as language rights or the place of Quebec in Canada; the environment was rarely brought up by politicians of any political stripe. He believes that having environment rights in the constitution will allow Canada to advance past its stagnant environmental regulations and rules that have led many international organizations in the last decade to criticize Canada for our lack of international cooperation on these issues. Boyd looks at countries all around the world that have already successfully placed environmental issues in their constitution, or are in the process of, and argues that in many cases these countries made a dramatic shift in their environmental policy. So, why can’t Canada? This work is divided into several chapters that focus on how other countries’ have entrenched the right to a healthy environment and how Canada should follow other countries examples. The first two chapters examine why Canada needs constitutionally entrenched environmental rights and the history of environmental rights in Canada from 1969 onwards. It presents strong arguments on why Canada should follow other countries’ examples including how it will stir policy makers into action and solve the jurisdictional issues surrounding whether the provincial or federal government have jurisdiction on environmental issues. He reveals some interesting facts about how the environment did not factor into the constitutional discussions during the 1970s and beyond. I am disappointed however that he did not fully engage in the historical question of Canadian environmental law and rights. We have to acknowledge that the division of powers of 1867 did create confusion over which level of government could legislate on the environment. In addition, there are other important milestones before 1969 such as the Constitution Act, 1930 that contributed further to the diffusion of environmental responsibilities. Finally, he provides short snappy arguments as to the cons to the right of a healthy environment. This section could have been strengthened if Boyd discussed more about the role of the crown in Canada which was, in theory, suppose be the steward of Canada’s natural resources. The majority of the book deals with Canada’s international law obligations and environmental rights in other countries. It is here that Boyd shines as he gives many examples of how different countries entrenched environmental rights into their constitutions and the policy changes that followed. It is here that readers may be disappointed to see just how much Canada has fallen behind the rest of the world. Environmental rights in a state’s constitution are not a novel idea. Most countries around the world have already implemented them. Canada has also signed numerous treaties and we have failed to live up to our obligations. Boyd argues passionately that Canada cannot ignore international law and more pressure will be placed on the Canadian government to make these necessary changes. In the final chapters Boyd presents a number of remedies that Canadians could pursue including going through the Supreme Court of Canada. In the end constitutionally protected environmental rights are what Boyd believes is the best answer to address some of Canada’s most pressing environmental issues. Despite some misgivings I recommend this book to all historians who are interested in seeing how history, law and the environment come together to form this gap in Canada’s constitutional history. This work builds from Rachel Carson’s Silent Spring, a environmental history classic, where she suggested the right to a healthy environment back in the early 1960s. More recent authors that have examined this subject matter include Tim Hayward in his work Constitutional Environmental Rights. This book challenges the assertion by industry, government officials and authors like Diane Saxe in Environmental Offences: Corporate Responsibility and Executive Liability that either industry is already doing enough to regulate themselves or that constitutional amendments will not change Canada’s environmental record. Boyd makes a clear case that Canada is not doing enough and we are falling behind the rest of the world on environmental matters. The flow of the book makes it an easy read as sections are short and to the point. It is important to acknowledge that the history of other countries, in this case how different states dealt with the question of environment rights, can affect our domestic affairs. More research needs to be conducted on the question of environmental rights in Canada and how, during a period where many countries started to implement constitutional changes on the environment, Canada was silent. Michael Rowan earned his MA in history at York University in Toronto. He is now a research assistant at York University and his current work is on the relationship between the state and citizens during the protests against federal airport construction in the 1970s. Citation: Michael Rowan. “Review of David R. Boyd’s The Right to A Healthy Environment: Revitalizing Canada’s Constitution.” The Otter ~ La Loutre Reviews. (March, 2014).